Part of the fun in writing this blog is that I already know what's coming next, and you all reading it do not. Well, for Day 271, I'm going to have to blow the surprise and tell you what was coming on Day 272. The next two day's entries are related. On Day 272 I auditioned for my own show on the Oprah Winfrey Network. On Day 271, the thing I've never done before was to fill out the 16-page questionnaire for the audition. I printed several copies of the application before heading to Wal-Mart on Day 270 and tossed them in the backseat of my car. When I finally took a look at them later, I felt overwhelmed. The application was 16 pages long. Pages 1-3 were eligibility requirements, making sure all contestants were at least 21 years of age (yep), willing to travel to Los Angeles (sure thing), and not currently an elected official for public office (definitely not). 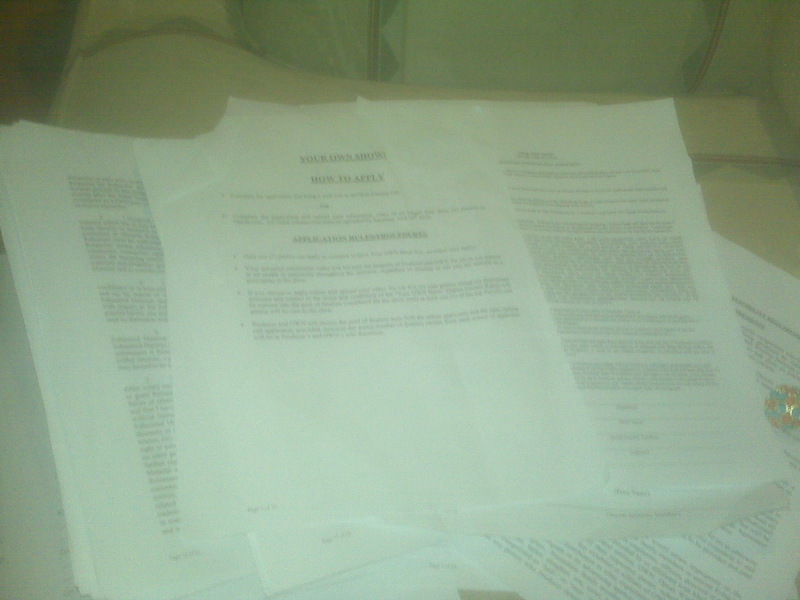 Pages 11-16 were release forms, which consisted of a lot of legal jargon I didn't understand. I just signed them, releasing my likeness, releasing the answers to the questions. Pages 4-10 was the actual application, full of questions ranging from extremely easy and standard to extremely thought-provoking. I didn't really do more than glance at the questions until the afternoon of Day 271, less than 24 hours before I was supposed to actually turn the application in to Oprah's producers. I realized pretty quickly that not all of these questions were going to be easy to answer. And I was running out of time. There was a part of me that wondered if any of these questions even mattered. If I got there, and pitched the greatest show idea the casting director had ever heard, would how I described myself in one sentence make a difference in the long run? Probably not, but it didn't change the fact that the application had to be filled out. I knew I'd likely bomb the audition, but I didn't want to be eliminated on a technicality. FF and I had plans to go to dinner that night. He suggested, after I told him I was stressed, that I should bring the application to the restaurant and he'd help me fill it out. I knew there was no way he would be able to help me, "describe my high school experience," (pretty fun, made lots of friends, learned a lot), but I took him up on his suggestion. Maybe, I thought delusionally, this could be a good getting to know you game. Some of the questions were pretty interesting, and could be a good way for FF and me to get to know each other. Name, Address, Phone Number, Email address, Schools Attended, Degrees Earned, Occupation. Interesting jobs. I'd say driving a truck and trailer across the country promoting Country Music Television qualifies as "interesting job." What is your dream job? Travel writer. I actually do that job, I just don't get paid for it. Not yet, anyway. Have you ever been fired from a job? No. Where did you grow up and how did it influence you? I refrained from telling them that Growing up in Columbia, South Carolina helped me garner an appreciation for strip malls. Instead, I said, "Growing up in Columbia was great. I have a great, supportive family and lots of friends, many of whom still live there. Everyone defines, "normal," differently, but my childhood was pretty standard." Wow, I thought, as I read back over my responses up to that point, I'm pretty vanilla. Nothing very interesting there. What's the most important lesson you've ever learned? I'm not sure when I learned this lesson, but I've learned that I'm only in control of myself and what I do. I can't force someone to care or demand that they do things the way that I do them. People don't change because I want them too. It sounds cynical, but it's actually quite liberating. Games as an adult? Does golf count? I think games are supposed to be fun. Golf is stressful. I'm going to have to come back to that one. Provide an example that shows your level of competitiveness. I started to write, "I'm really not that competitive at all," but then realized that in this instance, maybe complete honesty is not what they wanted to hear. I had to tailor my answer here to show them that if given the opportunity to try out for this job, I would fight for it in a way that would make for good TV. How can I convey who I really am, but let them know that I'm not opposed to making other contestants cry by clawing their eyes out to get ahead? This question was tricky too. How do you react when you lose? The same way I act when I win. How do you react when you win? The same way I act when I lose. Describe the most important person in your life. My parents. They think I can do anything. Describe your most embarrassing moment or experience. I can't remember the worst, but I'm sure it involved falling, either off of a bus or down some stairs. Tell us your most disappointing moment (getting passed over for a promotion), your best qualities (spontaneous, fun-loving, kind, adaptable), your worst qualities (sensitive, procrastinator, wear my heart on my sleeve), and what does success mean to you (success for me is being happy with exactly what I have and not wanting what someone else has). At about this point, I was over this application. Surprising, I know, since I've spent the last year talking about myself via this blog, but I was exhausted thinking and talking about myself this much. These questions were thought-provoking and made interesting for conversation for a while, but since I actually had to write my answers down for someone else to read, I couldn't really enjoy the discussion. What types of people intimidate you? I'd say off all the questions, this one stumped me the most, because it was one I hadn't really thought about before. I don't intimidated too often, but people who intimidate me are usually ones that are completely different from me. People who are reserved, careful with their words, effortlessly cool, and borderline aloof. Since I've never been like that, I find those who are, intimidating. At the top of Page 9, the paper read, in all capital letters: PLEASE ANSWER EACH QUESTION HONESTLY. I had been honest on Pages 4, 5, 6, 7, and 8 (minus the question about being competitive), but maybe they were looking for some good storytelling? Whatever, I thought, it’s too late to go back. I’m letting my answers stand. Have you ever hit anyone in anger or self-defense? No. I'm a chicken. Other than my brother when we were kids, I don't think I've ever even slapped someone. I hugely regret this, at age 29, because I can think of some people who deserved a little slap from me. This is when the "getting to know you game," started to get interesting, and I thought about fabricating some story about a huge bar fight I got into once just to see what FF's reaction would be. The fun and games stopped, however, when I arrived at the next question. Are you now, or have you ever seen a therapist, psychologist or psychiatrist? I sat back in my chair. He gave me a puzzled look. "I've seen a therapist before," I said, matter-of-factly, as if I was revealing that I used to be a man or that I had several illegitimate children. He tilted his head towards me and smiled. I resisted the urge to keep talking but the urge to explain to him why I had seen a therapist prevailed. "It was years ago and I had a lot of anxiety and I wasn't sleeping or eating and I just needed to get some stuff out," I said in one long sentence like a crazy person. If he was ever confused as to why I had seen a therapist, he probably wasn't now. "Okay," he said again. He did not seem at all fazed by this information. For the record, I'm not ashamed that I've gone to therapy. I think therapy is highly underrated. I'm just not sure this is the sort of information I was ready to share at this time, at this location. My tendency to "over share," had once again put me in an uncomfortable position. Regardless, he seemed to take it well. In an effort to divert the conversation, I went on to the rest of the questionnaire, which was pretty easy. Why do you think you'll win? Because my idea is awesome, and so am I. What do you bring that is completely unique? My self-deprecating humor. And my hair. It asked about allergies (none), medications (none), arrests (none, yet), felonies (none). And then I signed off that all of my previous statements were the truth as I know it. Therapy and all. Don't know what I need to do to get your attention but.. again, is it possible to get Rose psychic phone number? it will help me. Golf itself is not stressful, but often times the people we play with are!